CLOSELY MONITORING YOUR AIR SUPPLY WHILE DIVING GREATLY INCREASES YOUR ODDS OF NEVER BEING INVOLVED IN AN EMERGENCY AIR-SHARING SITUATION. However, there is always the possibility that you, your buddy or a nearby diver might run low on air. Regardless of how vigilant and conscientious you are, the need to share air while at depth is a real possibility. 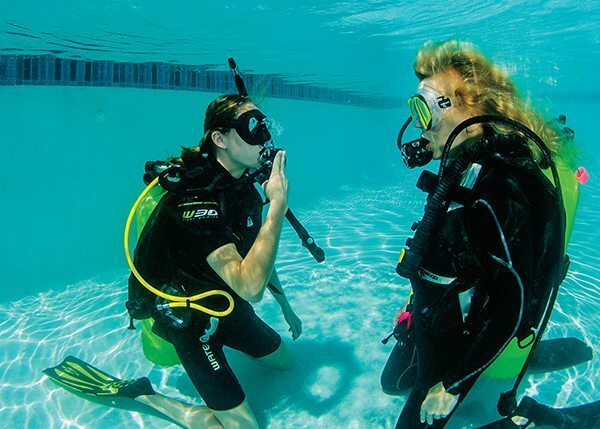 Every diver should be capable of and practiced at sharing air. In the early days, before the advent of the safe-second regulator (octopus), when faced with an air-deprivation situation, divers were required to buddy breathe. This involved the diver with the functioning air source sharing his or her second-stage regulator; he only had one back then, with the diver experiencing problems. The divers would alternate taking two breaths and passing the regulator back and forth. This routine continued as they made a slow ascent to the surface. Buddy breathing was a challenging skill, but the only option was performing an emergency ascent. In the late 1970s the safe-second regulator (octopus) was introduced. The safe second provided the diver with two second-stage regulators — a primary and secondary. The diver breathes from the primary while the safe second is attached to the front of his buoyancy compensator (BC) in plain sight where a diver in need of air can conveniently locate it. To make sharing air easier and more convenient, the safe second is typically mounted on an extra-long, low-pressure hose. 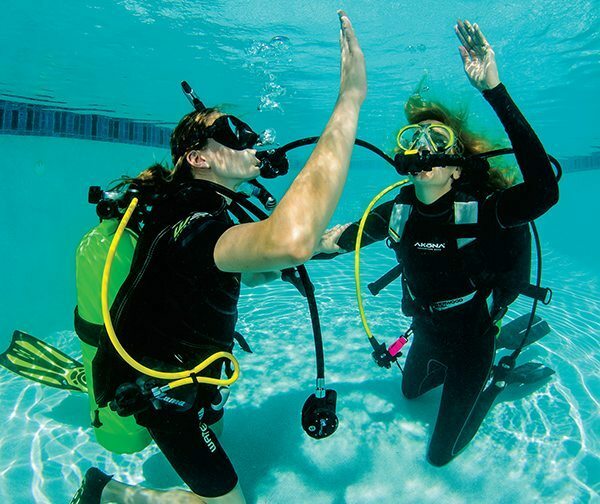 When an air-sharing situation arises, the diver in need of air (the recipient) swims to the diver with the functioning air supply (the donor) and signals that he needs to share air. The donor has the option of offering his primary second stage to the recipient and retrieving and breathing from his own safe second, or simply offering the safe second. In reality a recipient is likely to grab and breathe from whatever functioning air source is nearest; sometimes it might be the donor’s safe second, other times the donor’s primary second stage. When without air, being polite and following proper protocol are sometimes not foremost in one’s mind, especially if emergency skills have not been practiced recently. Even though the safe-second regulator has made sharing air easier and safer, it still has its drawbacks. First, having an additional hose routed beneath your arm and the octopus attached somewhere on the front of your BC increases the complexity of your equipment configuration and might create additional drag. Second, quite often divers forget to secure the octopus to the BC or during normal diving activity it comes free from its holder and dangles. Then, as the diver swims horizontally near the bottom, the octopus drags in the substrate. Sand and other debris can enter the regulator, which eventually causes maintenance issues. In addition, divers are trained that the octopus should be attached to the front of the BC; that is where an air-deprived diver will look for assistance. If the octopus is dangling free it will take the diver valuable seconds to locate it. In an air-deprivation emergency, time is critical. There are various types of BC-integrated safe-second regulators, but all are similarly configured. Instead of a traditional octopus regulator mounted on the end of a long low-pressure hose, the integrated safe second is part of, or attached to, the BC’s inflation/deflation hose/mechanism. Depending on the brand and model, the integrated regulator may resemble a traditional second stage attached to the BC inflation/deflation hose, or it might appear more like the traditional inflate/deflate mechanism with a larger mouthpiece and a purge button. Either way, the integrated regulator receives air from the same short low-pressure hose that provides air to inflate the BC. Being integrated into the BC and part of the inflate/deflate system places the regulator on the diver’s left lapel, where it is readily accessible at all times. Since it is part of or attached to the BC’s corrugated deflation hose, you don’t need to worry about it falling out and dragging in the sand. The integrated safe-second regulator eliminates some of the challenges divers experience with the traditional under-the-arm hose-mounted octopus. However, some divers still prefer the octopus because they claim the integrated regulator is not long enough to reach and comfortably fit in the donor’s mouth and allow him or her to turn the head to the right. In an air-sharing emergency the primary objective is for both divers to be in possession of a functioning air source. When equipped with a traditional octopus, the donor may pass his octopus or his primary second stage to the recipient. When the donor is equipped with a BC-integrated regulator, the equipment configuration makes passing the safe second impractical. To share air the donor must remove his primary second-stage regulator from his mouth and pass it to the recipient, and then retrieve and breathe from his own integrated octopus. The air emergency begins when one diver swims to another and signals that he needs to share air. The donor immediately takes control by making secure physical contact with the recipient, typically by firmly grasping the recipient’s BC or forearm. He then removes his primary regulator and guides it into the recipient’s mouth. The recipient should make secure physical contact with the donor and help guide the donor’s primary regulator. To make it easier for the recipient to use the primary regulator, many divers replace the primary regulator hose with a longer one. The donor then reaches down and grasps his own integrated second-stage regulator, places it in his mouth, purges it and begins breathing from it. 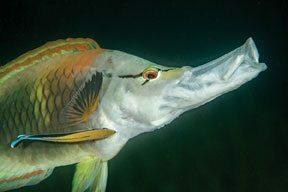 All the while both divers should be exhaling a steady stream of small bubbles anytime they do not have a regulator in their mouth. 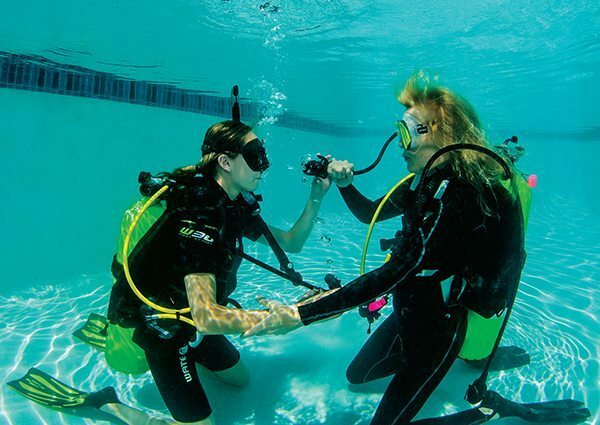 Once air sharing has begun and the divers are maintaining physical contact, unless the donor is running low on air, there is no need to immediately rush to the surface. It is more important that both divers regain their composure and are reasonably comfortable sharing air before they begin the ascent. Since both divers are breathing from the same first-stage regulator, staying close together and maintaining positive physical contact throughout the ascent is extremely important. If the recipient drifts too far away, the second-stage regulator could be pulled from his mouth. The divers should make a normal speed ascent, including safety stop, if the donor’s air supply is sufficient. Upon reaching the surface the recipient must orally inflate his BC, while the donor can use the power inflator. Hopefully you’ll never be faced with an air-sharing emergency. However, just in case, every diver should be trained and maintain proficiency at sharing air, both as a donor and as a recipient. Also, practicing with both the traditional octopus and a BC-integrated safe second is important. 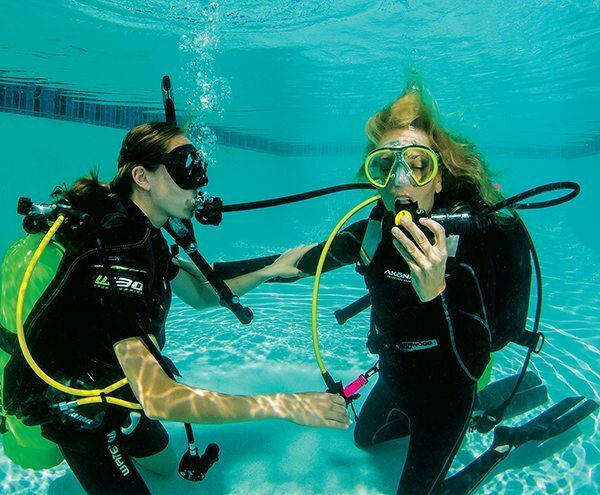 On the first dive of every dive outing, or in a pool prior to the outing, every buddy team should practice sharing air. In addition, whenever a new or different regulator setup is used the buddies should familiarize themselves with it and then practice air sharing at depth. The same applies when diving with a new buddy. A few minutes of practicing sharing air could prevent a potential tragedy. [ONE] After indicating that she is out of air, this diver signals that she needs to share air. [TWO] Donor removes own primary second-stage regulator and passes it to the out-of-air diver. [THREE] Having given away her primary regulator, the donor immediately feels for her integrated safe second. [FOUR] After locating her integrated second stage reg, the donor places it in her mouth, purges it, and begins breathing from it. [FIVE] Positive physical contact is important to prevent divers from becoming separated while ascending.